"Tashi Lhunpo was founded by H.H. 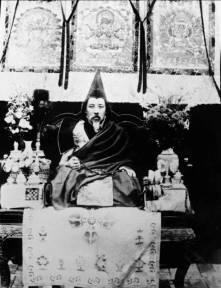 the 1st Dalai Lama, Gyalwa Gendun Drup, in 1447. It is one of the four great monasteries of Central Tibet which was supervised and looked after by the Dalai Lamas and Panchen Lamas and has the glory of producing thousands of renowned scholars in the field of Mahayana Buddhist Philosophy. After the invasion of Tibet in 1959, Tashi Lhunpo Monastery was re-established at Bylakuppe in South India in 1972. The monastery has monks coming from Tibet and Himalayan regions like Spithi, Khunu, Ladakh, Ghashar and Sangkhar. 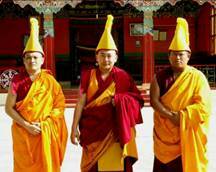 At present there are over 250 monks including many Tulkus (reincarnate lamas). The monks have to go through year intensive program of study of both sutra and tantra, debate, and are instructed in the creation of sand mandalas and butter sculpture, ritual performance, music, chanting, dance and basic literary skills in Tibetan and English. Each monk must also complete a two to three month meditation retreat for each of the principal deities and protectors, in order to qualify to perform their rituals. The cycle of retreats might take up to six years to complete. Mandala (kilkhor) he Sand Mandala is regarded within Tibetan Buddhism as sacred and, until 40 years ago, was rarely seen outside the monasteries. Architectural in structure, their complex and richly coloured designs have remained unchanged for over 500 years, the skills and secret meanings passed faithfully down through the generations from teacher to student. The monks make these exquisite mandalas from memory, approaching the task within the framework of ancient ceremonial Tantric ritual, and bringing to the process extraordinary patience and concentration. The Sand Mandala is built from coloured sand, ground from rock from the Himalayas, and then poured precisely onto the mandala design using a 'chak-pu', a cone-shaped, fine-tipped metal funnel. To adjust the sand once it is on the blueprint, a metal scraper called a 'gyud-ti' (tantric knife) is used. The mandala is constructed from the center outwards. Once the mandala is completed, it is then dismantled, first by the removal of each of the deities represented in the mandala and then with a 'dorje', the head lama cuts through the main lines, thus cutting the energy of the mandala. The remaining sand is then swept up into the center of the mandala and placed in an urn. In a ritual procession, the monks then carry the sand to the nearest moving water, where the sand is symbolically scattered to demonstrate life's impermanence.